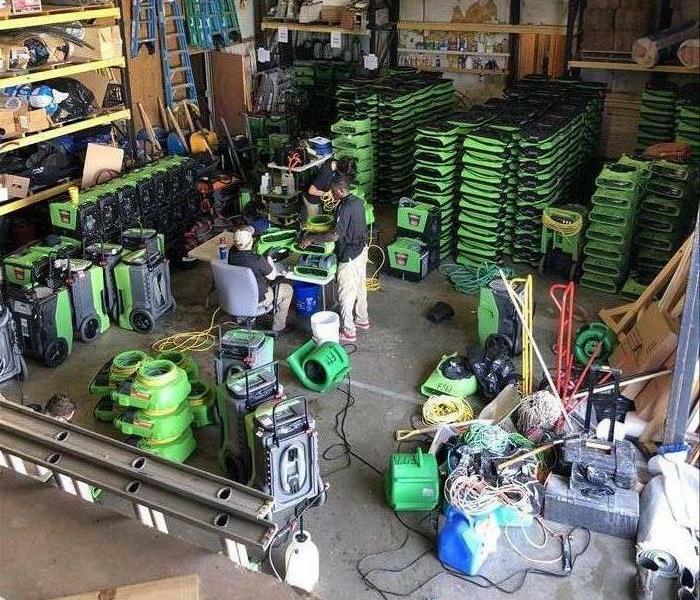 SERVPRO of Warren County is part of the Disaster Recovery Team that SERVPRO offers. This means that when a natural disaster strikes in an area and the local franchise can't get to everyone in need, other Franchises will pack up and head out to that area to help with the cleanup. This Bowling Green School had a pipe burst in the ceiling causing water to cover this classroom. Our crews were on site immediately to stabilize the situation and start the drying process. This class was back in session within 3 days! The flooring in this image was damaged by a water loss that impacted several rooms in this home. Our team responded quickly to the call to clean up and repair the home. If you have a water loss, call SERVPRO! Our team was brought in to repair this home after it was damaged by flooding. You can see just how high the water got by looking at the flood line. If your home is damaged by flooding, call SERVPRO! 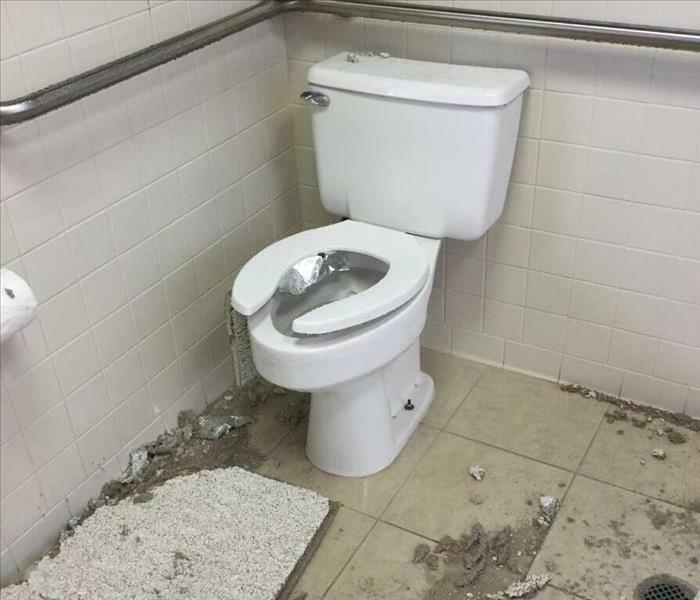 A leaking toilet can often be fixed before it gets out of hand. However, if it isn't addressed, it can do more damage than you might think. 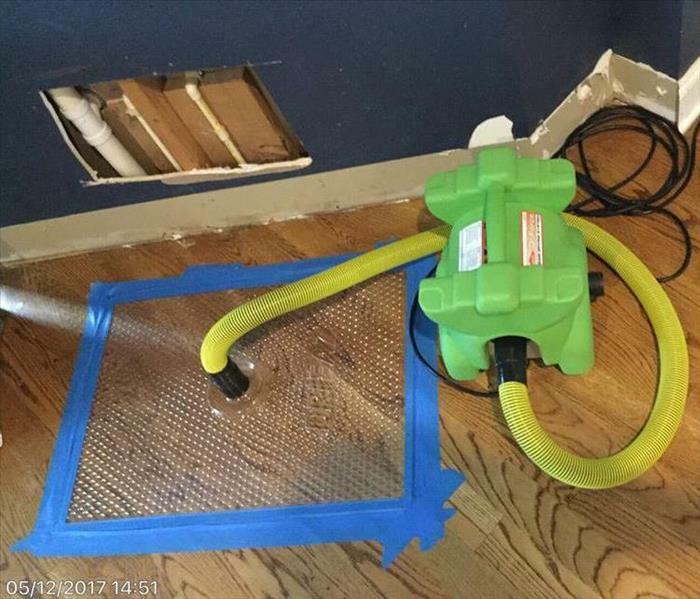 When that happens, call SERVPRO. We are faster to any size disaster. High winds and heavy rains from a severe storm invaded this home leaving the mess you see pictured here. If your home is damaged by storms, call SERVPRO. We are faster to any size disaster. Flood cuts are cuts that are made a few inches above the flood line and they allow us to remove the damaged material from the home. In this image, can see flood cuts we had to perform in this home. 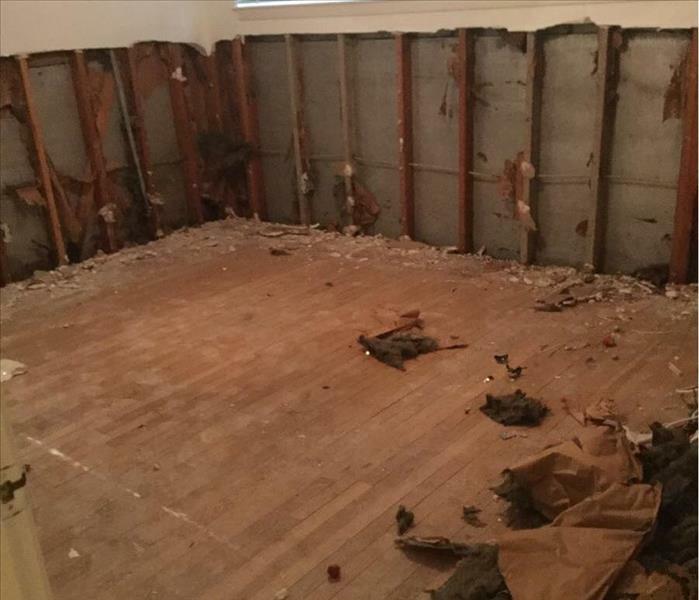 This home required quite a bit of demolition after a water loss in order to repair the damage. 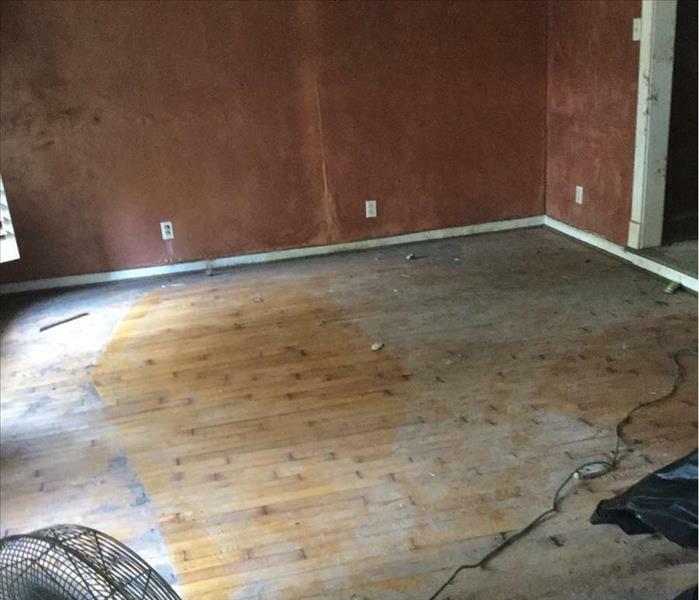 In this image, you can see that we have removed the drywall and flooring in this room. Because it is critical to get the moisture taken care of quickly after a water loss, you will often see us using drying equipment such as this air mover to help speed up the drying process. This basement suffered heavy flooding as you can see from the image. Heavy rains were the cause of the flooding. Our team was called in to clean up and repair the damage to the home. Our team got a late night call and responded to water in this commercial facility. Our team was quick to respond and begin the extraction process. Once all of the water was removed, we began placing drying equipment. 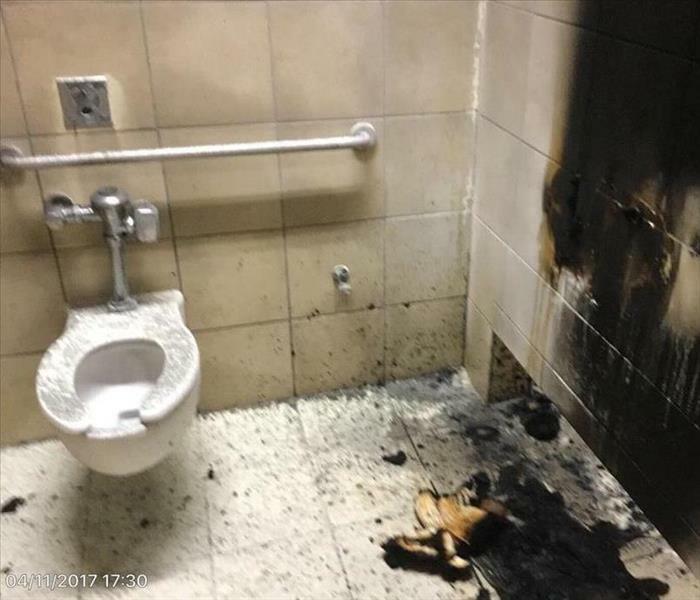 Fires can occur anytime, and they can happen anywhere! Sometimes even SERVPRO gets affected by a disaster, this time a fire broke out outside our office building. Good thing we could quickly arrive at the scene, right? 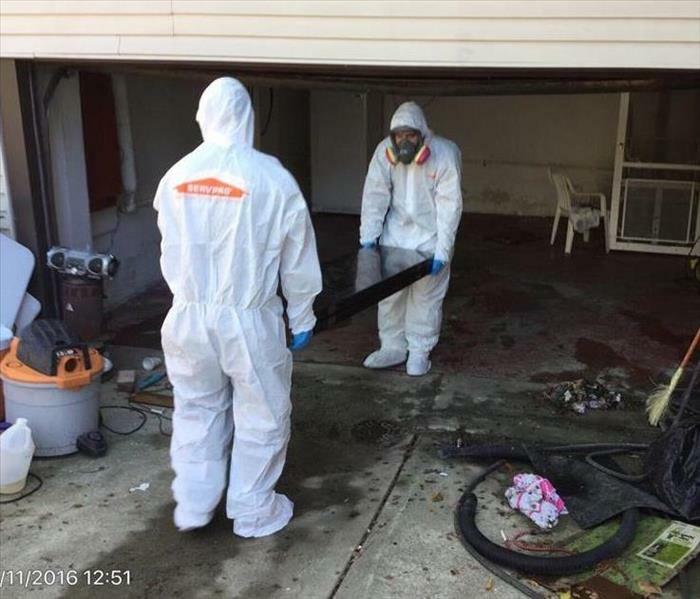 After a fire broke out in a local home in Warren County, SERVPRO was quick to the rescue! Fire damage can be devastating and the restoration can be a hassle. But don't worry, you can always trust SERVPRO! 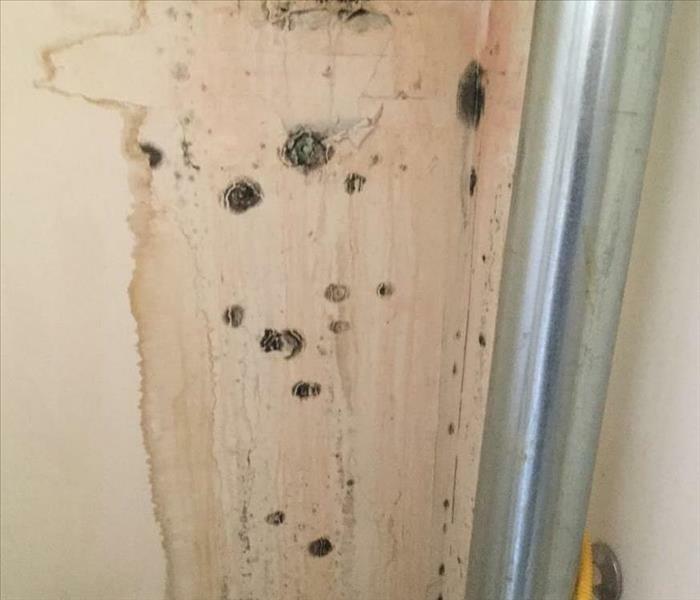 The Mold in this Warren County Duplex was caused from a burst pipe in the laundry room. SERVPRO of Warren County was able to clean and sand the affected area and spray an antimicrobial in order to prevent future growth. 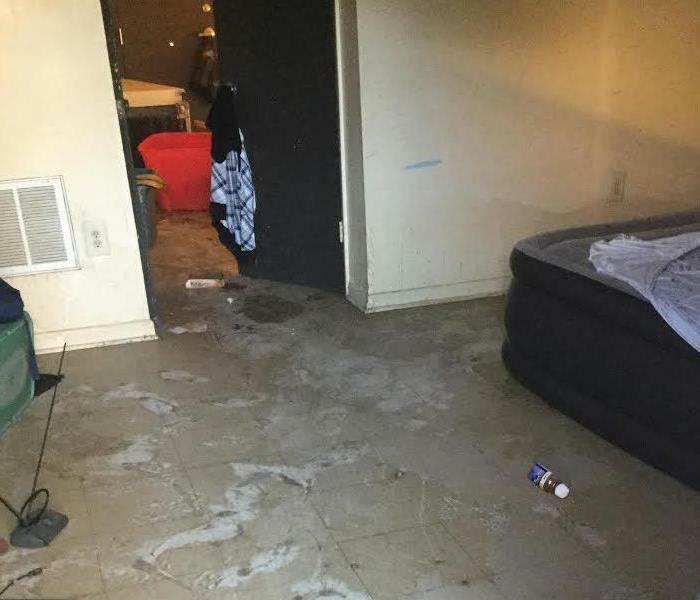 The Living Room in this Missouri home was flooded after several days of non stop raining. 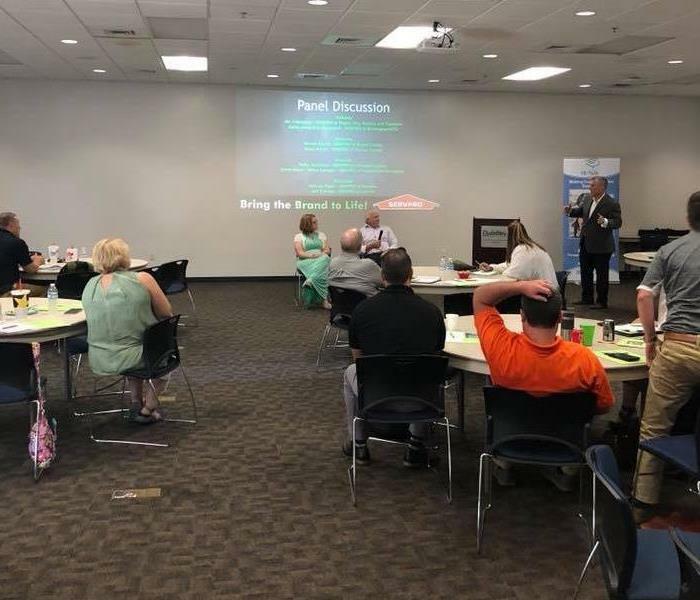 Our Warren County SERVPRO team was in town helping out local franchises with an over abundance of claims. Our crew is very humbled to be able to help out in times of crisis. 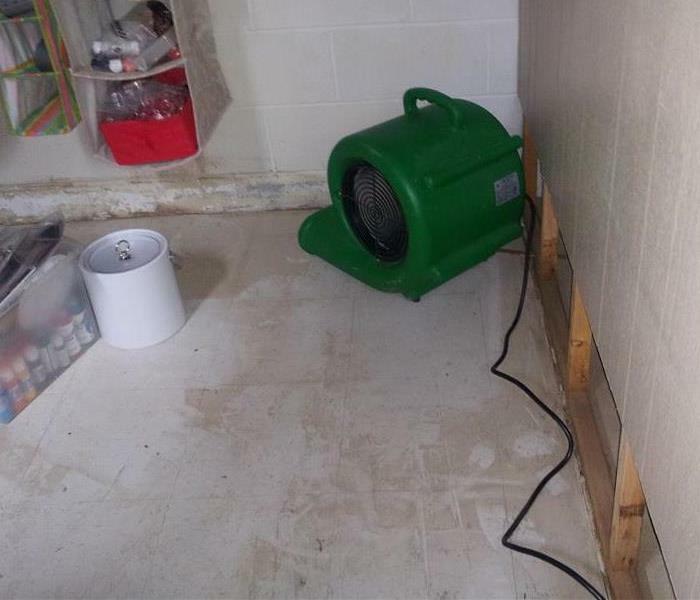 The hot water heater had leaked in this Warren County Kentucky home for an undetermined amount of time causing mold to grow under the several layers of flooring. 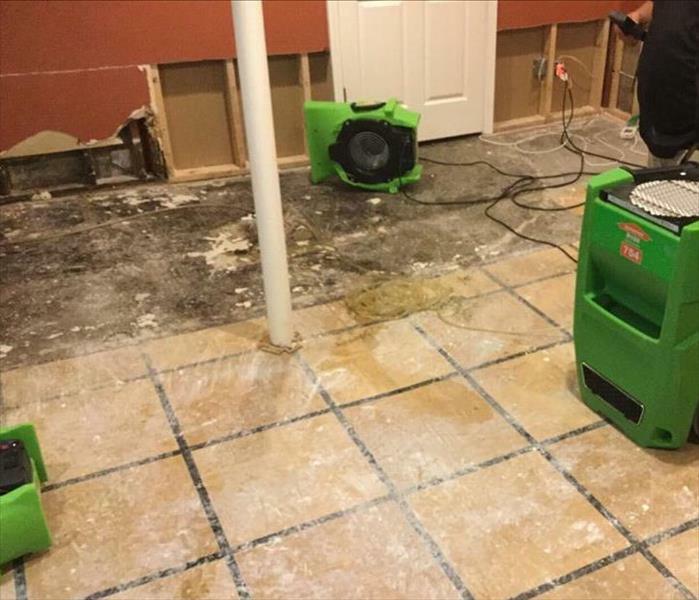 SERVPRO of Warren County was able to remove the affected flooring and make this homeowner very happy! 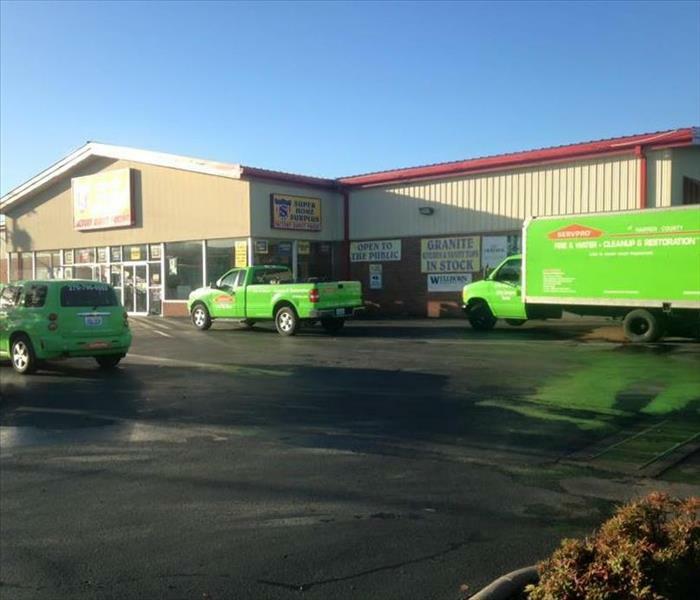 No job is too big or too small for our SERVPRO of Warren County crew! After the fire at this Bluegrass Cellular office the insulation had to be pulled....all the way up to the ceiling. No problem for our crew, they jumped on the lift and got it done!! 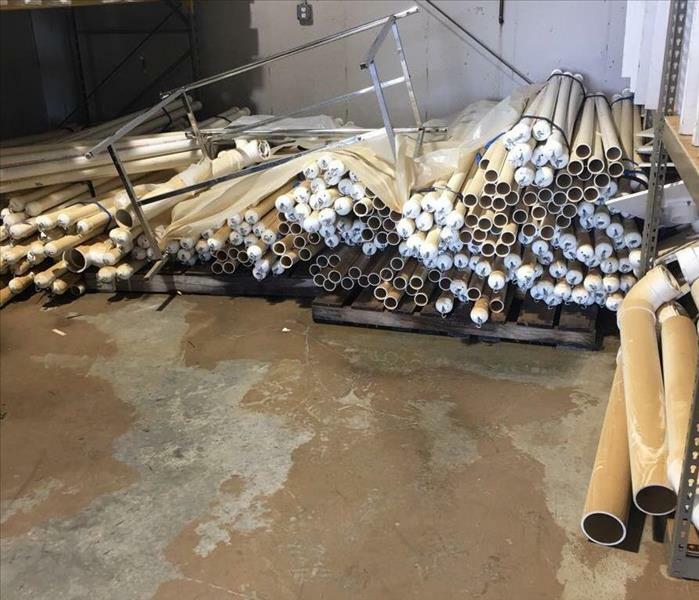 This warehouse in St. Louis sustained substantial water damage during the recent flooding. 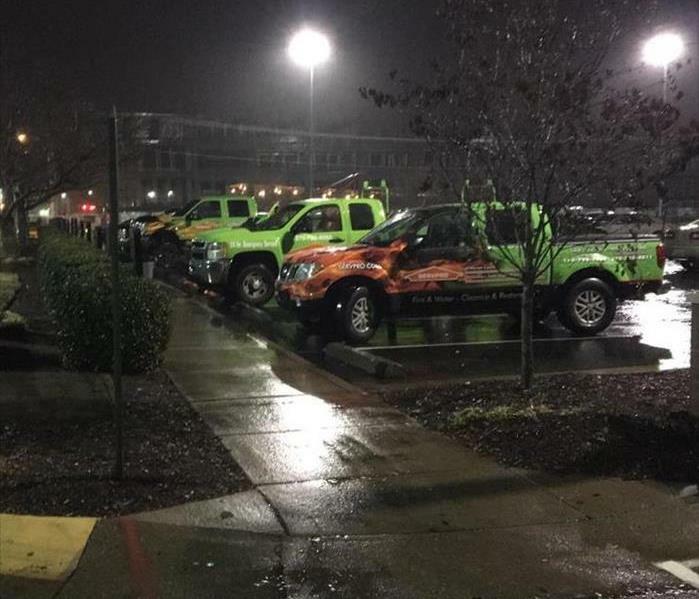 Our Warren County SERVPRO traveled 4 hours and spent 10 days helping flood victims get their properties cleaned up. Just one way that SERVPRO goes above and beyond to help make it "Like it never even happened." 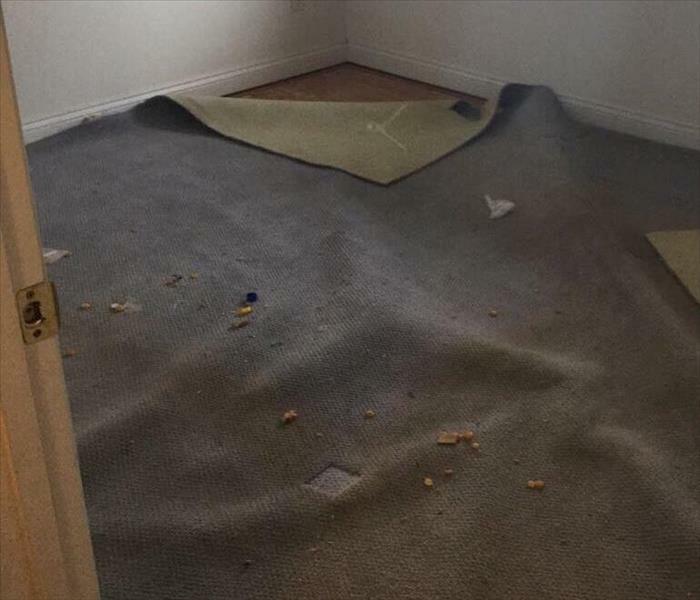 A burst pipe in this Bowling Green, KY home caused damage to the hardwood flooring. 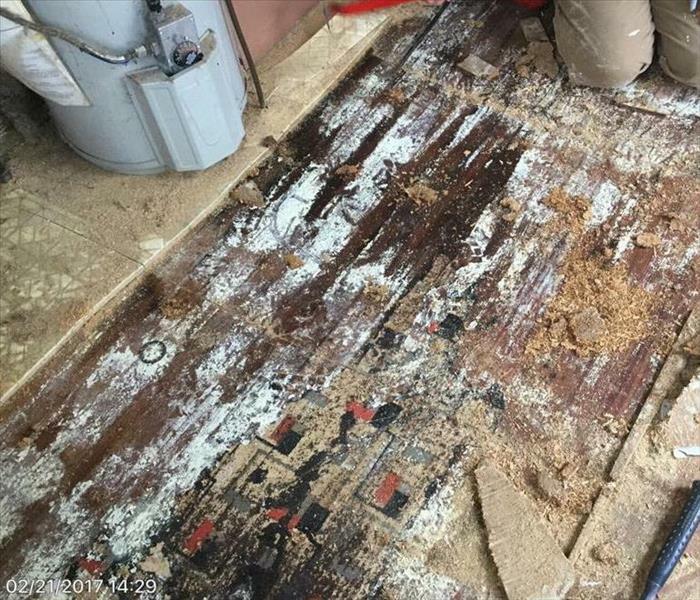 Our crew at SERVPRO of Warren County was able to put drying mats in place to pull the water out of the wood and make sure that the flooring did not buckle. 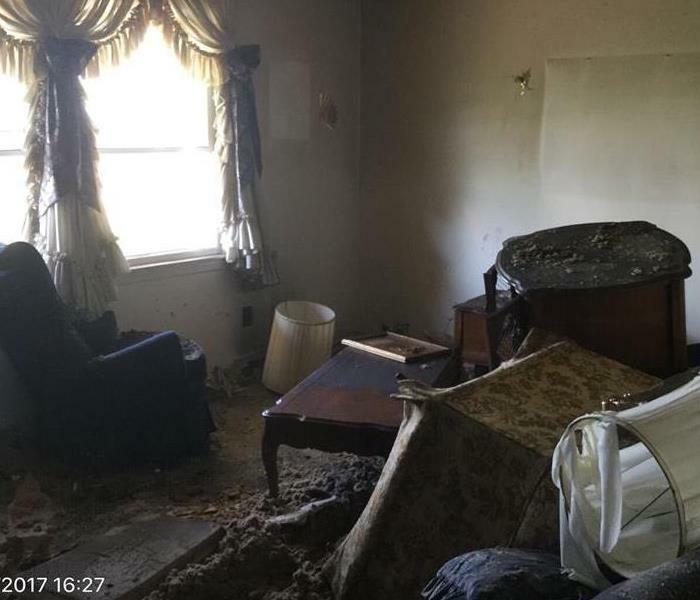 This home in Warren County, KY was damaged when the roof leaking during a massive rain storm. Most of the rooms were affected and extensive drying and cleaning had to be done to get the home back "Like it never even happened." 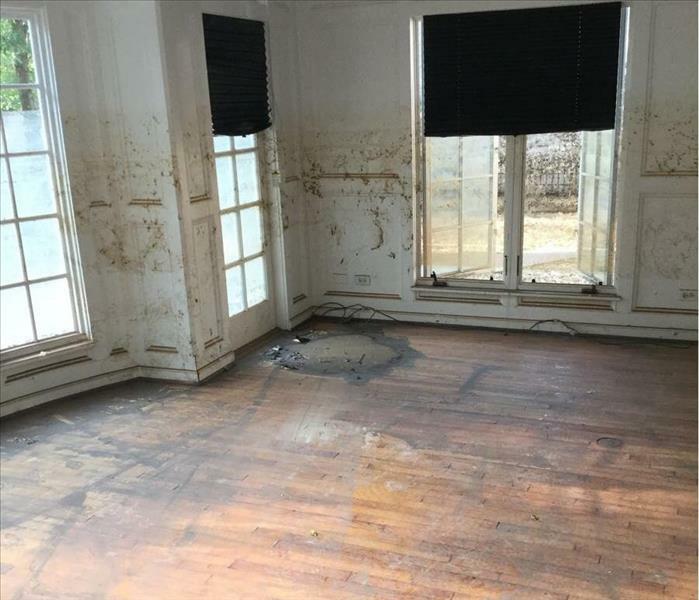 A long term leak caused the mold in the flooring of this Warren County home. If you let things sit too long you can end up with a bigger mess than taking care of it when it happens. When disaster strikes call SERVPRO of Warren County!! The Laundry Room of this home in Warren County Kentucky had some mold growth due to high humidity and a small water leak. 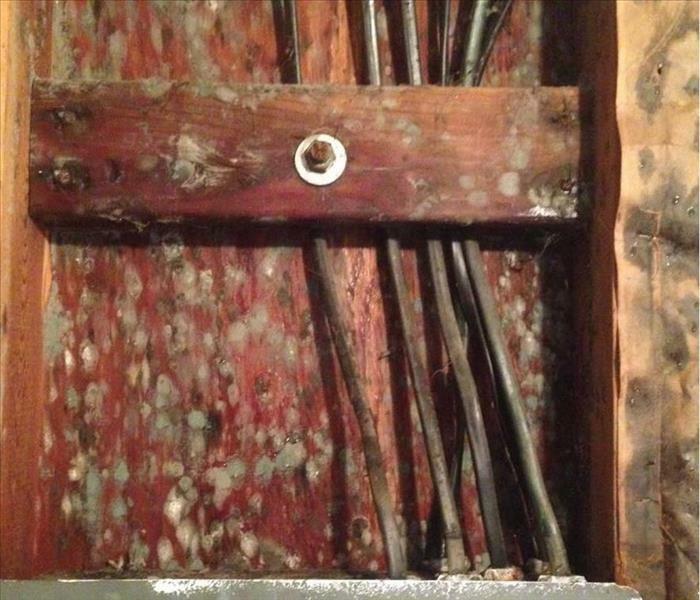 The leak was fixed, however, the owner wanted to take care of the mold for the tenant's health and safety. Humidity caused mold on the joists of this crawlspace in Warren County Kentucky. The insulation was starting to sag and you can see the spots growing on the wood in the photo. Mold can cause health issues for some people as well as being annoying and smelly. This basement in Cleveland was had several inches of standing water before we arrived on the scene. Several Storm Teams were called in to help with the many claims that were coming in. SERVPRO of Warren County is proud to be available when other communities are in need. This home in Cincinnati was flooded with sewage when torrential rains caused the city storm drains to overflow. 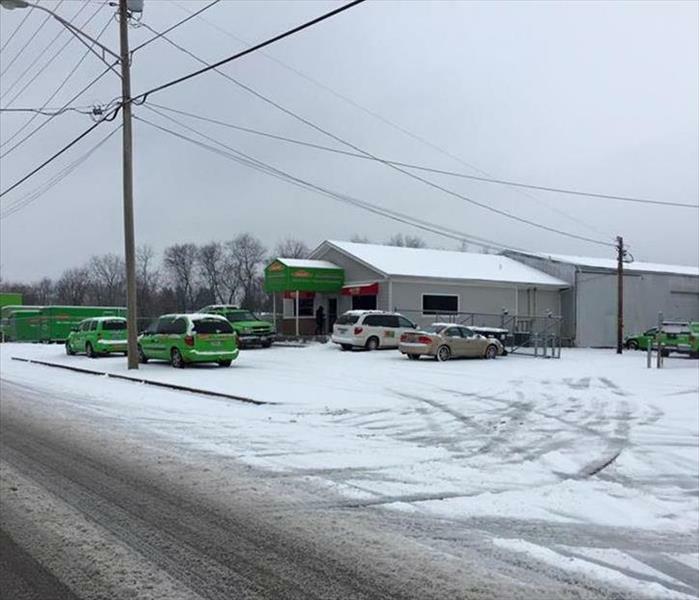 SERVPRO of Warren County was at the scene to help out local franchises that were inundated with jobs. 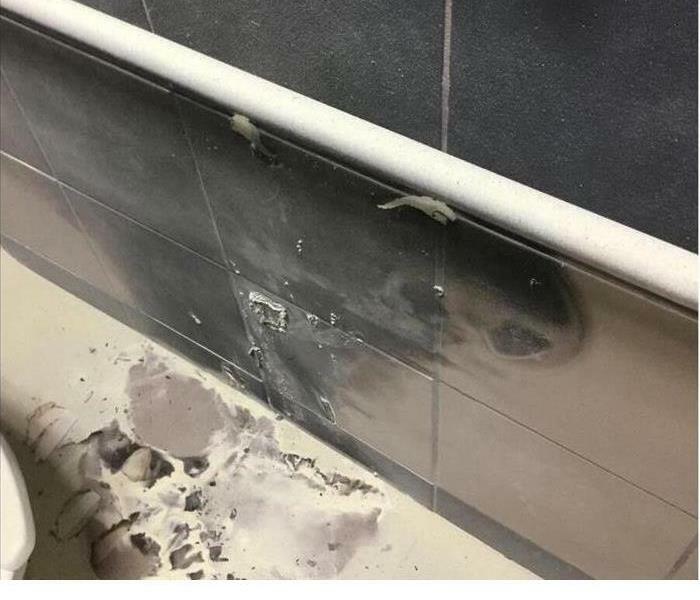 A student set the toilet paper dispenser on fire in this Warren County School. Fortunately it was put out before it could do any further damage. SERVPRO of Warren County was able to get the mess cleaned up and everything back to normal for the next school day. 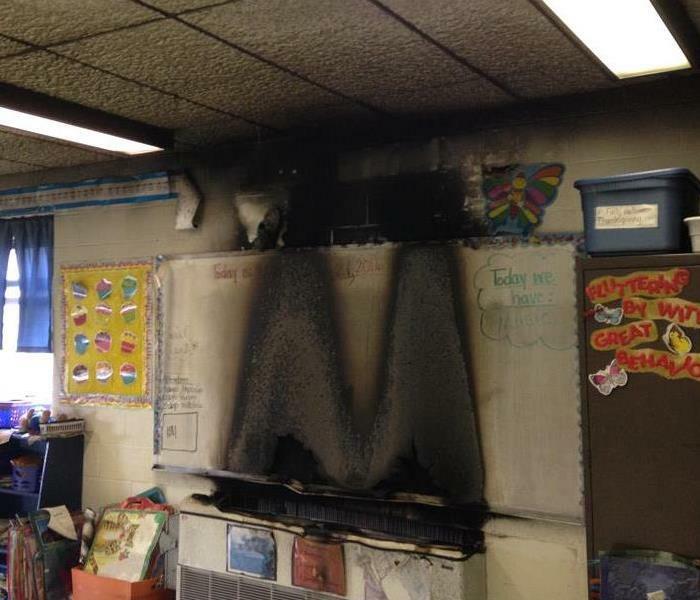 This classroom was damaged when the heater caught fire and destroyed this whiteboard. 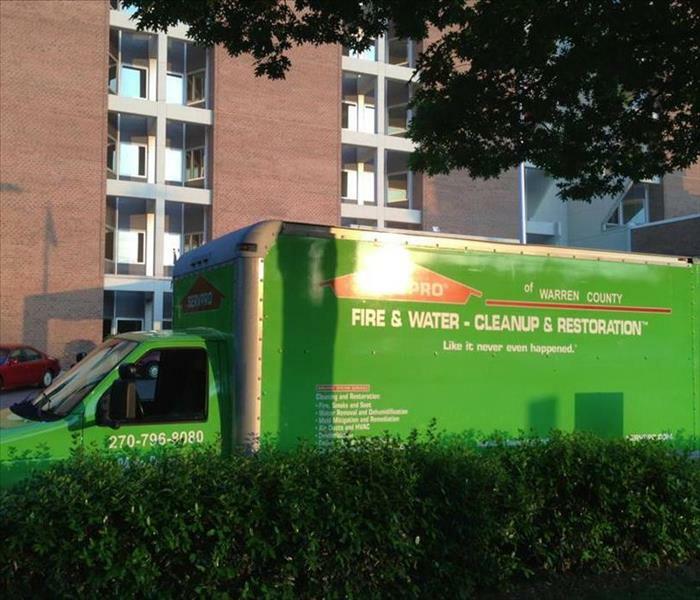 Smoke damage was a big issue but SERVPRO of Warren County was able to get everything taken care of and they didn't even have to shut down the school. This leaking toilet in Alvaton, Kentucky left 2 inches of water standing throughout several rooms of the home. 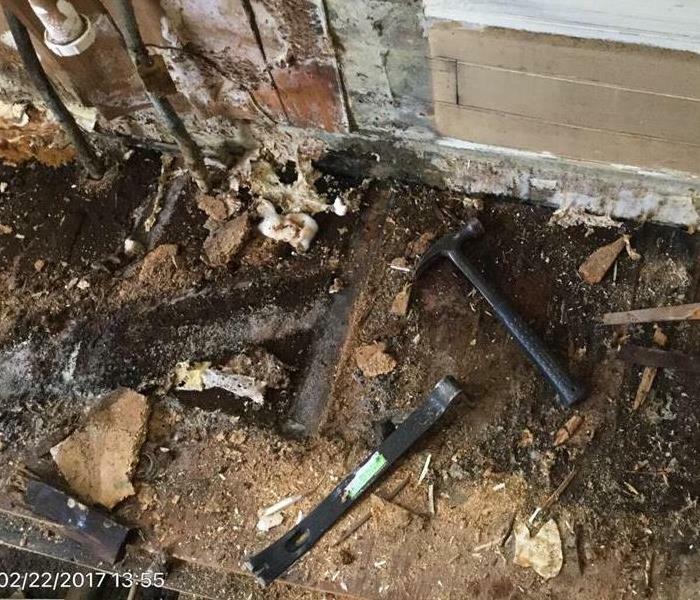 SERVPRO of Warren County was able to get on the job before the plumber even arrived and was able to start extracting water and cleaning up the mess. Water had leaked into the wall cavity of this office in Bowling Green, KY causing mold growth. SERVPRO of Warren County removed the drywall and insulation, cleaned up the mold and sprayed antimicrobial to help prevent future mold growth. The customer was very happy that we were able to complete this job so quickly. When a pipe burst in this Alvaton, KY home there was damage in the Kitchen and garage. The ceiling tiles were even sitting on the truck that was in the garage. 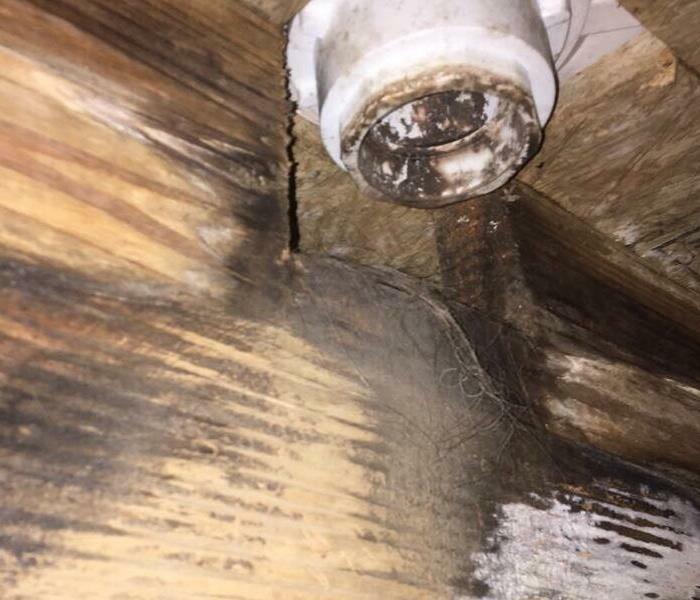 SERVPRO of Warren County was on the scene and made it "Like it never even happened." This home sustained severe roof damage when the roof caught fire. 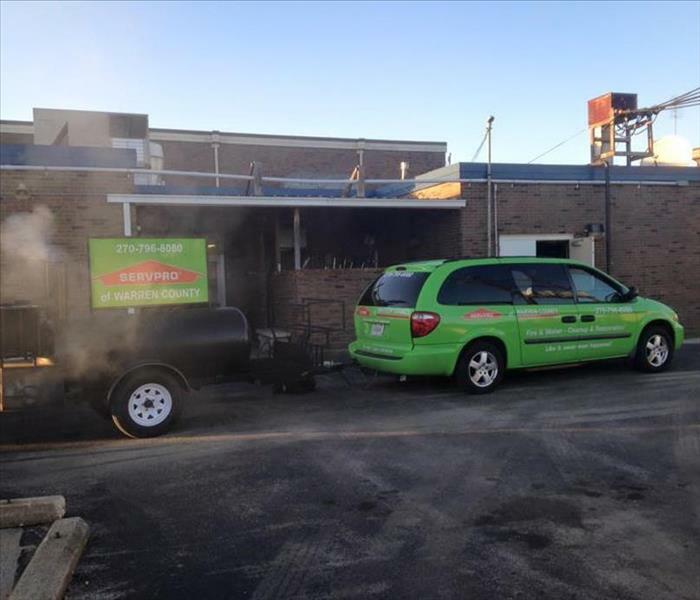 SERVPRO of Warren County was on the scene while the smoke was still filling the air. When you have Fire, Water or Mold problems give us a call!! It only takes turning your back for a minute for things to get out of control in the kitchen. This home sustained severe damage when the Coffee Maker caught fire. In a crisis we are always there to lend a hand and help get your life back on track. Hurricane Matthew in Lumberton, NC was just 1 of 3 Storm events that we participated in last year. 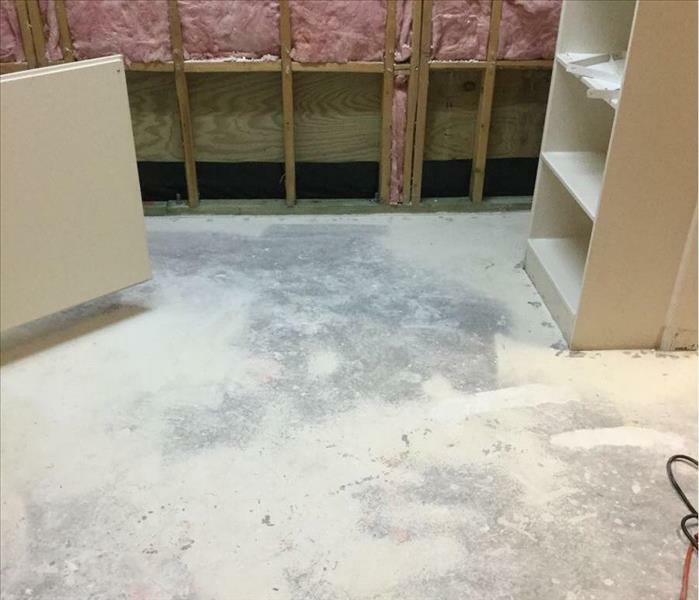 Several feet of water had flooded this basement and we had to come in and tear out drywall and set equipment to try to get things back to normal. The toilet overflowed in the upper floor of this local business causing the ceiling to collapse on the floor below as shown in this photo. When SERVPRO of Warren County arrived on the scene we were able to quickly extract the water and clean up the debris. It was just a couple of days until this bathroom looked "Like it never even happened." This job in Cincinnati was caused by severe rains that backed up the sewage and storm drains. 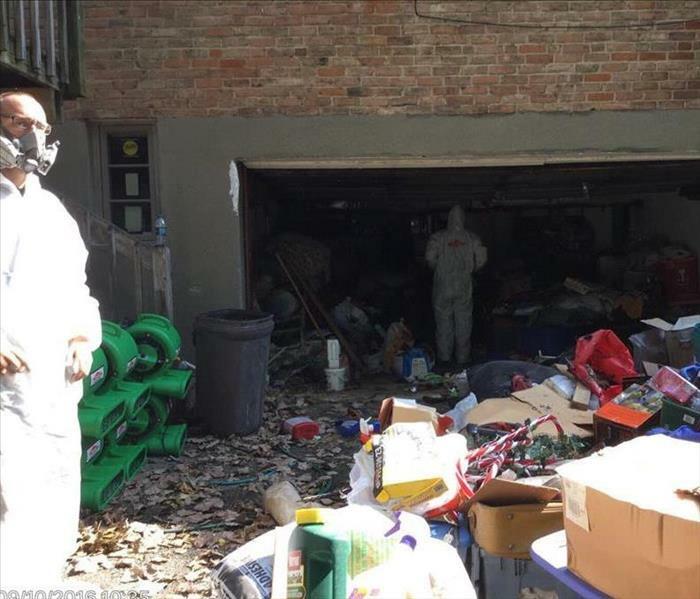 There was mud and sewage and dirty water covering the floor and contents of this garage. Our crew was suited up with Tyvek Suits and Respirators to make sure that their health and safety was not compromised. 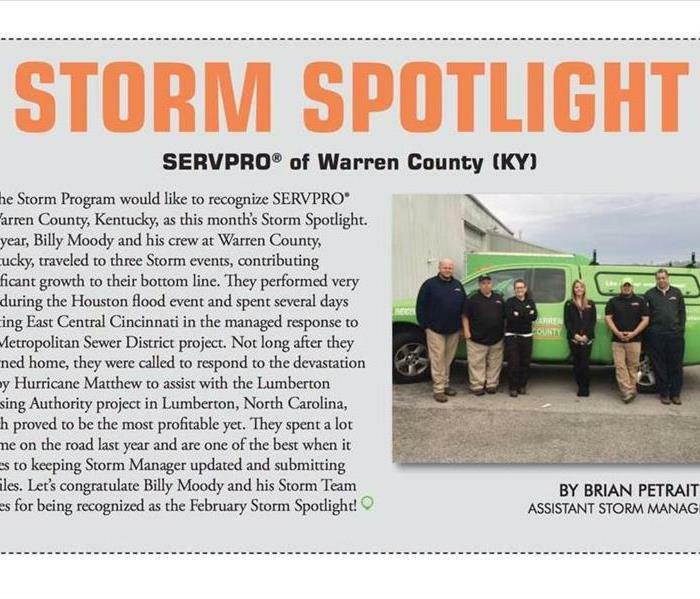 Our Warren County team is proud to be recognized by SERVPRO Corporate as the February Storm Spotlight. Our crew's dilligent work in 3 storm events has earned us this recognition. Thank you to our team and thank you SERVPRO!! This was a commercial job we were doing for Midtown Apartments here in Bowling Green, KY. Having prime access to the building entrances is important for our service professionals to be able to get in and get the job done quickly. Standing water requires quick extraction and we couldn't do it without the proper equipment and access. In-home disasters can be overwhelming for anyone. When we were notified of a water loss at this residential property in Bowling Green, KY, we knew we had to arrive on scene as quickly as possible to provide reassurance to our customer that we were the right people to do the job. After all, we are faster to any size disaster! This water loss was due to a busted pipe underneath their kitchen sink and the water spread very quickly causing a lot of damage. 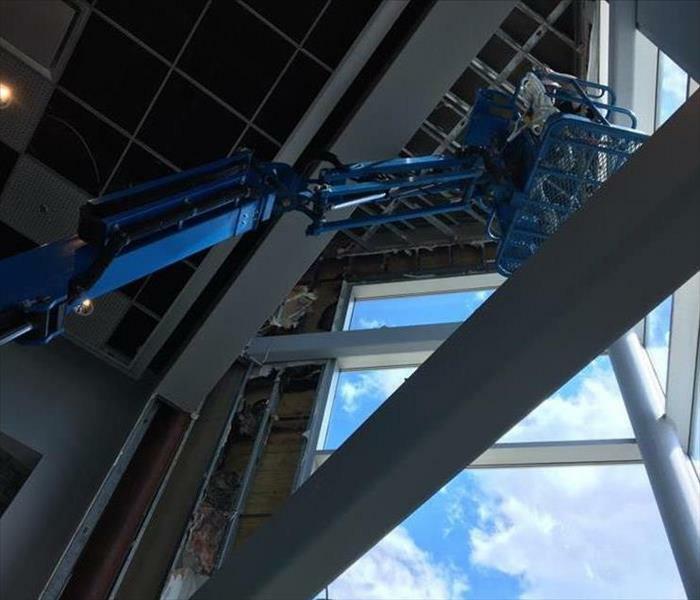 We are dedicated to being fast on site to prevent further damage. We often get calls for commercial properties. 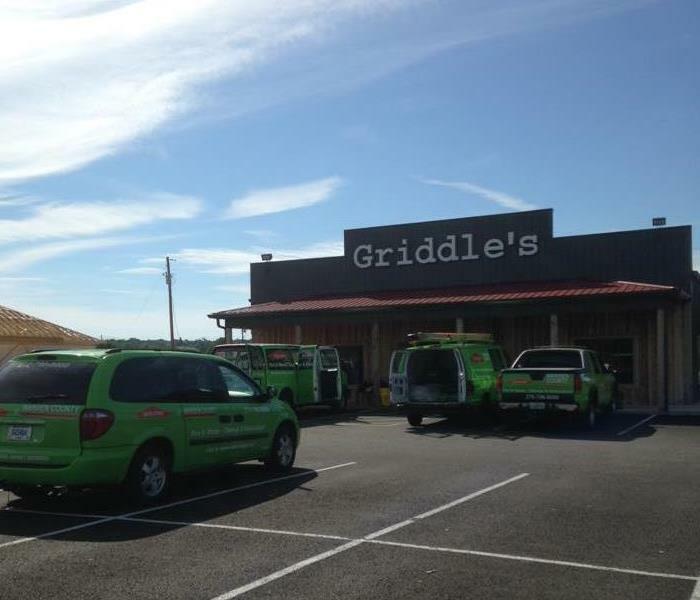 This instance was a kitchen fire with a lot of smoke damage at a local resturaunt in Scottsville, KY. We were quick to round up our service professionals and arrive on scene within 4 hours as a SERVPRO promise. 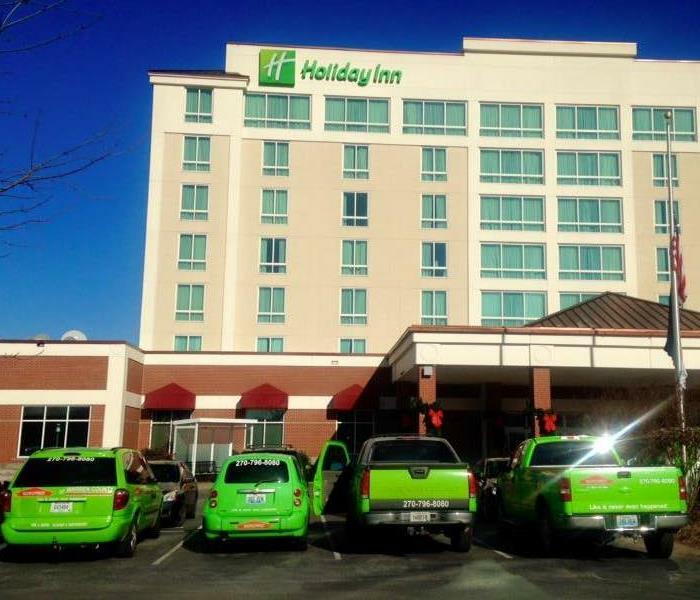 We travel in packs so that we can get the job done quickly and efficiently. One morning at 5:30 we were notified of a fire at a commercial property in Bowling Green, KY 42101. 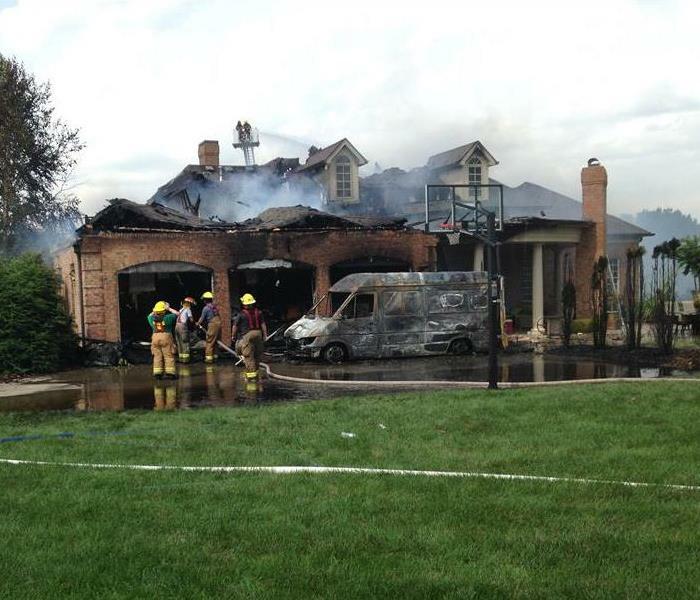 Our Sales and Marketing Manager arrived on the scene within 30 minutes to find water, fire and smoke damage. She jumped right in and started helping clean while subtly mentioning the things that SERVPRO could do to help them. Within an hour she had signed the job and had a crew on site to help get the business back up and running. At your time of need, we are here for you! Community involvement is a top priority for SERVPRO of Warren County. Our local schools are a very important part of our community. We jump at an opportunity to do the cooking for their fall festivals or any fundraiser they may have. If you would like for us to come out and cook for your fundraiser, please contact us a 270-796-8080 or 270-202-4213. This local hotel had a pipe burst in a main conference room. We were on the job within an hour of the call. We understand the importance of keeping everyone calm and reacting in a professional manner. It was a crucial part of the their business to get this job cleaned up and this room open as quickly as possible. Although they had to rearrange some of their special events scheduled for that evening, we had them up and running within a few days. They were happy customers! If you have a pipe burst or a sewage issue, call us TODAY! Large water losses require an abundance of equipment. Our equipment is all commercial grade and made to run 24/7 to get your property dry as quickly as possible which is an important aspect in preventing bacteria growth! Don't wait when you notice water damage, we want to keep your property at its best! Before we arrive at a water loss, we load up our equipment into our trucks and we head out as quickly as possible. When we get on scene, we unload this equipment in a timely and orderly fashion so that we can place it as soon as possible. It is important to get your structure dry as soon as possible! If you have standing water or visible water on a hard surface or carpeted area, it is important to get that water extracted quickly to prevent further damage. Inside this truck is a motorized extraction unit which we hook up a hose and wand to in order to clean up that water immediately. Do you have 20 out of 30 rooms of your property that have water damage? No problem! Call SERVPRO of Warren County! We are faster to any disaster! We are prepared 24/7/365 to serve you! It is important to have a team of professional technicians that work well together! 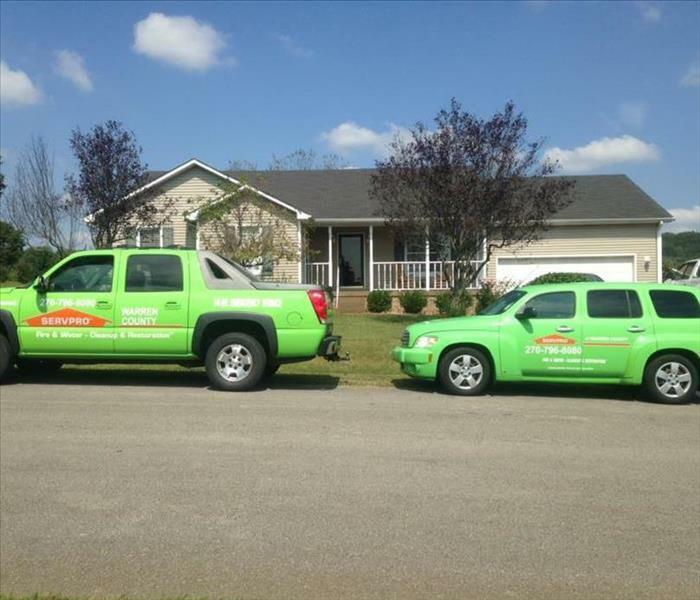 SERVPRO of Warren County practice team work on a daily basis. We work together for the better of our clients!